Anthony Marshall arrives Monday morning at court in New York for sentencing. He got one to three years in prison. 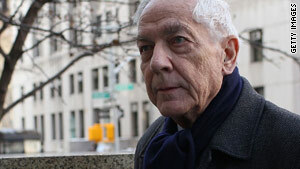 New York (CNN) -- Brooke Astor's son got one to three years in prison Monday for scheming to bilk millions of dollars from the late philanthropist's estate. Anthony Marshall, 85, had been found guilty of 14 of the 15 counts against him. Marshall was convicted in October of the most serious charges -- first-degree grand larceny and scheming to defraud. He faced a minimum of one to three years, or as much as eight to 25 years in state prison. Marshall's wife, Charlene, sobbed after hearing the sentence as supporters hugged her. One of the most serious convictions involved Marshall giving himself a $1 million-a-year raise for handling his mother's affairs, said Assistant District Attorney Joel Seidemann. Marshall's former attorney, Francis Morrissey, was also convicted of five counts relating to the case, including forgery and scheming to defraud Astor. Seidemann on Monday recommended a sentence of 1.5 to 4.5 years in prison. He objected to bail pending appeal but told the judge he had no problem with Marshall staying out of prison until the first of the year. He asked for restitution of $12.3 million. Defense attorneys argued Monday for the lowest sentence of one to three years in state prison and asked that the judge not impose restitution. The defense team raised concerns about Marshall's health and indicated that it will appeal the verdict. In a brief statement to the court before the sentence was announced, Marshall only said, "I have nothing to add to what my attorneys have said." The judge ruled that Marshall must surrender on January 19. Assuming he goes to prison, Marshall can apply for parole after eight months. Or he may apply for immediate parole for medical reasons under a new provision called medical parole. The judge also gave Marshall's co-defendant, attorney Francis Morrissey, the same sentence of one to three years in prison. Morrissey was convicted of four felonies and a misdemeanor, including forgery and scheming to defraud Astor. Like Marshall, Morrissey's sentence will not begin until January 19. Astor's grandson, Philip Marshall, declined to comment after the sentencing. He was concerned about his grandmother's care in her final years, which the younger Marshall's attorney deemed "elder abuse," that eventually led to his father's indictment. Marshall was convicted October 8 of 13 felonies and one misdemeanor. The felony of grand larceny in the first degree carried a sentence of one to three years. The other counts will run concurrently. "These defendants, two morally depraved individuals, preyed on a physically and mentally ill 101-year-old woman to steal millions of dollars -- dollars that she had intended to go to help the lives of ordinary New Yorkers," Seidemann said, echoing his closing argument to the jury. The sentence came after a six-month trial that featured as witnesses a "Who's Who" of New York's social elite, including Henry Kissinger, Graydon Carter, Barbara Walters, Vartan Gregorian and Annette de la Renta. The trial was a tabloid feeding frenzy, fostering headlines such as "Bad heir day," "Mrs. Astor's disaster" and "DA's kick in the Astor." During trial testimony, Marshall's attorneys called no character witnesses to come to his defense. But before sentencing for the crimes, friends and celebrities who knew Marshall well wrote letters to the court trying to show what they believe was his true character. Marshall was a loyal, churchgoing man, a Purple Heart recipient wounded in Iwo Jima during World War II and a son who tried mightily but could never live up to the high ideals of his socialite mother, according to letters friends submitted to the court. Whoopi Goldberg told a judge in her letter that she met Marshall and his wife 10 years ago when Goldberg moved into a building on the Upper East Side. Her interactions with Marshall, she wrote, gave her an insight into his relationship with his mother, and in turn taught her about how fame can affect family dynamics. "I also understand what it must be like for my own daughter to be around my fame," she wrote. "I am not comparing myself to Mrs. Astor, but I've seen how you can be dismissed as not being good enough, or hip enough, and seeing it happen to Tony made me make sure that it didn't happen to my own daughter." NBC's "Today" show weatherman, Al Roker, also came to Marshall's defense, having met him at his church 10 years ago. He argued Marshall had suffered enough, paying a price greater than any sentence a judge could hand down -- seeing his son turn on him during the trial and being portrayed in a negative light each day. "Given his advanced age and deteriorating health, justice may be better served by turning a compassionate eye towards this good son, father and patriot and finding it in your heart not to add 'prisoner' to Anthony Marshall's otherwise unblemished resume," Roker wrote in his letter to the court. Goldberg, too, wrote she believed "breaking this man" by putting him in prison was not the right punishment. "Please don't put him in jail," she wrote at the end of her letter. "It would only amount to an unnecessary cruelty that would serve no real purpose. Hasn't Tony been through enough?"